Keeping you on the edge of what’s next Learn why occupiers and owners will both benefit from the research and insights found in The Edge. Experiencing the experiential workplace As the experience economy continues to mature, see why you must think differently about competitive differentiation. What’s the value of building certifications beyond certifying buildings? Gain an understanding of why certification is a healthy choice. Leading with innovation: Google on their real estate success Google discusses innovation, technology and the future of real estate in this exclusive sit-down. #Girlpower: women winning in the workplace The time is now for women in CRE. Hear wise words from our women. Building the story behind the building KBS Realty Advisors discuss how they maximize the value of their portfolio. The pulse on healthcare consumerism How does this whole new approach to healthcare impact real estate? Free returns? How the surge in eCommerce drives demand for reverse logistics warehouse space. Deliberating the duties As trade tensions continue to heat up between the U.S. and China, much is at stake. eSports: a gamechanger in real estate eSports has made its mark on the most coveted generation of viewers and participants the world has ever seen. Urban farming takes root in CRE A new trend taking root in CRE has the potential to impact millions across the globe, read why. Will robots take over CRE? Are you feeling the impact of driverless cars, blockchain and other transformative technologies? PropTech 2.0 What’s next in PropTech? Privacy, please Explore the good and bad that come with smart technologies, and how to ease fears of the unknowns. Heroes at work: the next generation of talent Help your company better attract and retain veteran talent. Don't get left out of the cold Read how convenience and health food are stirring up cold storage demand. In it together Hear how Avaya reshaped their real estate strategy. What’s next for Cushman & Wakefield with John Forrester A sit-down with John Forrester on Cushman & Wakefield’s future. For several years, The Occupier Edge delivered innovative thought leadership articles specifically tailored to occupiers all around the globe. While our award-winning publication explores some of the hottest topics and trends impacting occupiers of real estate, many of these trends resonate with investors and affect the larger real estate ecosystem. Investors today need to be in the know and up to speed on the latest workplace trends in order to differentiate their offering and deliver value to their tenants and occupiers. With this in mind, we have rebranded and revamped The Occupier Edge to The Edge. By broadening the scope of our target audience to include both occupiers and investors, we’re creating a more comprehensive guide to modern real estate solutions. We sat down with Cushman & Wakefield’s Steven Quick, Chief Executive, Global Occupier Services (GOS), and Carlo Barel di Sant’Albano, Chief Executive, Global Capital Markets & Investor Services, to discuss how each business will benefit from the research and insights found in The Edge. Can you talk about the evolution of The Edge? STEVE After talking to several of our occupier and investor clients, we realized that both groups wanted us to start looking at the industry – or ecosystem – in a more holistic way. There’s real value in sharing insights, trends and taking advantage of our comprehensive service offering for our clients. Broadening this magazine to target both audiences will help us achieve this. CARLO The Edge has an established reputation among readers, which makes it an ideal vehicle to share the perspectives of investors and occupiers on the most recent trends and opportunities in the fast-evolving world of CRE. Bringing the investor’s perspectives into the discussion will be extremely beneficial because it will highlight the different challenges they face. Not only will it aim to address the current state of affairs, but the articles will also look to the future on where service, technology, return expectations and other factors can ultimately impact the sector. How are current trends impacting clients and influencing their business decisions? STEVE Health and wellness is a huge trend in the world and we’re seeing this through the way people are consuming healthier food, becoming more aware of having a fit lifestyle and generally caring more about their overall wellbeing. In real estate, this translates to topics such as wellness certification, amenities and even work-life balance. Health has a big impact on the amenities in a building – from yoga to sit-stand desks to clean air, and it also impacts work-life balance and how employees feel at the end of each day. I don’t see this trend going away anytime soon, but rather becoming increasingly important. Another important trend impacting clients in the occupier world is data and building security. Since we often sit on client sites, we’ve invested a lot of time refining our technology suite to ensure it complements our clients’ data security protocols. Everything, from the simplest email to the sensors we put in buildings, needs to be enhance efficiency and security. (Refer to the article “Privacy, please” on page 44 for more information). Smart building technology and how it’s improving the overall employee experience is another timely trend impacting clients. Smart buildings reduce mundane tasks, make communication seamless and create an office environment that is happier and more productive. Going beyond controlling HVAC and lighting, smart buildings can mean personalization and mobility – with offerings, such as location sensors, to improve occupant satisfaction and productivity. CARLO The underlying objectives of the investor client are somewhat similar to occupiers – ultimately, they both need to be focused on how to best position and operate real estate and successfully execute transactions. Therefore, the trends discussed by Steve are absolutely top of mind as they evaluate capital allocation. However, the angle from which they look at the challenges is inevitably somewhat different. While occupiers look at real estate to align with their strategy and operational needs, investors, depending on their scale and mandate, have a broad national or global canvas. They have a significant amount of capital to allocate and need to evaluate the changing landscape to develop their investment strategy. Sovereign funds, pension funds, life insurance companies and high-net worth individuals have different approaches and objectives when investing in real estate. Some of the challenges include the allocation of capital, repositioning assets for value creation, value or wealth preservation and diversification. Investors are seeking access to market intelligence, deal flow, strong execution and ultimately, great returns. The landscape is further complicated by a time when the lines between traditional real estate companies and new entrants from the technology and services sectors are blurred. More than ever, the ability to embrace an interdisciplinary approach to real estate investment strategies and to deliver innovative solutions that satisfy the ever-evolving needs of occupiers is critical. What are the goals and priorities of occupiers in the real estate ecosystem? ENSURING VALUE CREATION Most investors of real estate are focused on value creation and ultimately value protection. Allocating a certain amount of capital into real estate has historically been perceived as a safer bet since you’re investing in an actual asset – the bricks are there. Local investors, in particular, have gravitated towards quality real estate as it provides a “safe haven” in complicated economies or unstable environments. ENSURING OCCUPIERS’ REAL ESTATE IS CONSISTENTLY MEETING THE NEEDS OF THEIR EMPLOYEES OR CUSTOMERS If their workplace is in the wrong location, has the wrong amenities or is not able to retain and attract the right talent or bring in the right customers, it’s a detraction. Our clients’ workplace needs to be adjusted to support its core business and to meet the needs of its employees and customers. ALLOCATING MORE CAPITAL TO REAL ESTATE More investors have significantly increased their allocation of capital to real estate - whether it’s investing in large institutions, pensions, funds or insurance companies. This is in large part due to the fact that there has been much greater transparency in the real estate sector over the past 10 years. Having more information at their fingertips allows investors to more confidently invest in real estate. This has been very positive for the industry overall. MAINTAINING FLEXIBILITY More occupiers are thinking about how they can take advantage of some of the flexible workplace products out there, incorporating more flexibility in their real estate footprint. From a coworking solution to desk sharing to renting out office space, occupiers are doing more with less space. PARTNERING WITH A SERVICE PROVIDER In recent years, clients have become much more attuned to contractual vehicles – they know what works and what doesn’t. Many are demanding more transparency with their provider, taking a much more partnerfocused or vested-light approach to their contractual arrangements versus a more traditional approach. What are the goals and priorities of investors in the real estate ecosystem? GETTING MORE UP TO SPEED ON REAL ESTATE From where they should allocate capital to what kinds of returns they need to achieve, investors must become much more sophisticated in their understanding of real estate. Being up on the current trends and knowing what their tenants want is critical. But, it’s become much more challenging as investors allocate capital globally rather than market by market and there is more competition for the quality assets. What’s the value of building certifications beyond certifying buildings? As sustainability and wellness certifications gain momentum, the question often becomes “To certify, or not to certify?” – but this binary approach misses the true intent of these systems. The focus should not be on chasing points, but building upon the strategies outlined in these building standards to create healthier and more environmentally-friendly workplaces. Certification is not just about the plaque – it’s about the process. Regardless of whether formal certification is pursued, every project can and should borrow ideas and strategies from leading sustainability and wellness frameworks to create a better built environment. By leveraging the extensive research that goes into developing each credit or feature, project teams can pursue proven, data-driven strategies that reduce impact on the environment while promoting health and wellbeing for occupants. The Cushman & Wakefield Global Headquarters in Chicago is a WELL Certified™ project and achieved Silver level certification. Market transformation The LEED Standard, which got its start in the early 2000s, is credited with being the first internationally recognized third party certification system. Before LEED buildings, the industry standard was merely code compliance. As a testament to the widespread influence of these frameworks, some jurisdictions and even countries have adopted green building standards such as LEED to serve as their de facto building code. Irrespective of whether these projects submit for formal certification, building certifications provide a uniform set of design and construction standards which did not previously exist. The emergence of the WELL Building Standard has been credited with launching what has been called â&#x20AC;&#x2DC;the Second Wave of sustainability,â&#x20AC;&#x2122; which identifies buildings as key influencers on human health. WELL has also engaged key stakeholders who have traditionally been left out of the design and construction process, bringing together the CRE community with human resource professionals to align objectives. LEED and WELL provided new guiding frameworks, as well as the necessary incentive, to go beyond conventional industry practices, thus setting a standard for higher performance in buildings. Additionally, these building standards provide valuable recognition and differentiation â&#x20AC;&#x201C; distinguishing truly green buildings from the rest of the building stock. Regardless of whether projects choose to formally certify, these rating systems have forever altered the nature of the conversation when it comes to best practices in design, construction and operations. Within the context of deciding whether to certify or not, project teams are forced to address important underlying questions like “What are the best practices outlined in these frameworks that we may want to adopt for our project?” or “What are the benefits that certified projects offer that a conventional project does not?” By encouraging all project teams to consider these broader questions, most inevitably adopt at least some best practices from these frameworks, leading to better buildings overall. educating the broader community about green building and wellness concepts. Whether projects choose to certify or not, they inherently benefit from the proliferation of sustainability credentials, which continue to elevate the collective knowledge of our design, construction and operations professionals. Cushman & Wakefield recently took their commitment to wellness to the next level by becoming a founding alliance member of the Well Living Lab. The lab, a collaboration of Delos and Mayo Clinic, researches the real-world impact of indoor environments on human health and wellbeing. Then it presents practical ways to create healthier indoor spaces. Considering the average American spends approximately 21 hours indoors – with a large chunk of this time spent at the office – this type of research will be instrumental in both the immediate and long-term. The lab’s studies focus on five significant facets of people’s lives: health, performance, stress and resiliency, sleep and comfort. These areas affect people in the workplace. The lab’s staff has expertise in medicine, behavioral, environmental, building and computer sciences, biomedical engineering and technology. Continual improvement and adaptation The building industry can often fall into a “let’s stick with what works” mentality. Contrary to the static ‘tried and true’ approach, green building rating systems are inherently designed to be flexible and dynamic – adapting to the latest technologies and best practices while continuing to raise the bar through increased technical rigor. The need for continual improvement has brought us LEED Version 4 as well as WELL Version 2, while spawning relatively new systems such as Fitwel and Reset. While we can’t predict the future, we can help to make it better. The question that project teams should address isn’t “should we certify?” but “how can we leverage the best practices outlined in sustainability and wellness frameworks to create buildings that minimize resource consumption while enhancing human health and wellbeing?” The beauty of frameworks such as LEED, WELL and Fitwel is that they are designed to benefit all projects, not just those with a plaque on the wall. It’s up to us to put the concepts to practice, creating a better future for our people and our planet. WOMEN WINNING IN THE WORKPLACE Let’s face it – when it comes to gender diversity in commercial real estate, we still have a long way to go. In the CRE industry in the U.S., only 23 percent of senior roles are held by women, and 31 percent of American businesses have no women in senior positions, according to a CREW Network Report on Best Practices for Gender Equity and Inclusion in Commercial Real Estate. Recent findings, however, provide a more optimistic outlook. According to a CREW Benchmark Study on Women in Commercial Real Estate, women filled more senior-level or higher roles in 2015 than they did in 2010 and 2005. The study also found that the percentage of women in commercial real estate worldwide grew from an estimated 32 percent in 2000 to 43 percent in 2015, and it’s continuing to grow each year. This is great news for women – and for the industry overall. Evidence supports that a genderbalanced workplace benefits a business’s bottom line as well as its employees. Research by Catalyst found that Fortune 500 companies with the highest percentage of female corporate officers reported, on average, a 35.1 percent higher return on equity and a 34 percent higher return on shareholder investment than companies with the lowest percentages of female corporate officers. According to the CREW Report, businesses where women account for the majority of top management have shown superior sales growth and higher cash-flow returns on investment. The report also found that diverse teams are smarter, scrutinize other members’ actions more closely and tend to be more innovative. 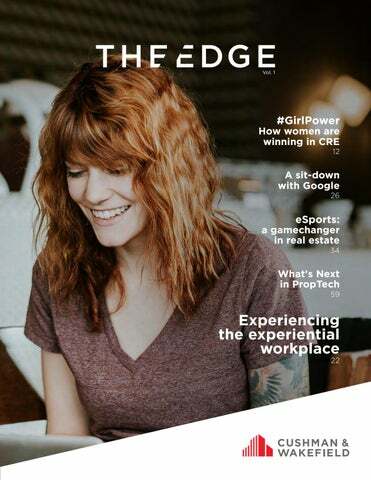 The Edge talked to several successful women within Cushman & Wakefield to find out how women are setting themselves up for success within today’s CRE environment, and what they need to do to position themselves as leaders. HOW WOMEN ARE WINNING IN REAL ESTATE Competition is fierce in commercial real estate, and firms must continue to deliver proactive, strategic and research-driven results. Overall, the perception of women has changed within commercial real estate as well, which has led to greater success for both women and men. WISE WORDS FROM WINNING WOMEN EMPOWERED MEN EMPOWER WOMEN, TOO As more women seek positions in the commercial real estate industry, support and mentorship from men will be vital to their success. Historically, men have sponsored other men in rising up the ranks within their companies, but sponsorship of women has only recently grown as part of companies’ cultures. In the CREW Report, women in real estate ranked the lack of a mentor or sponsor within their company as the number one barrier to success, with women being 54 percent less likely than men to have a sponsor. “When you look at who the leaders are in our industry, there certainly are many highly successful women, but the leadership is still predominantly men. To be successful, yes, it’s really important for women to help women, and to sponsor women, but that alone isn’t going to cut it. Our Women’s Integrated Network (WIN) is working to partner with men and together find solutions that will build gender equality in leadership roles and higher earning positions. Not only is this the right thing to do, but it drives business growth through more diverse perspectives and solutions for our clients,” said O’Neill. Cushman & Wakefield recognizes that women are a competitive advantage in the global marketplace. WIN's mission is to develop and support the talents of our women team members, and have meaningful impact on the firm’s performance. THE WOMAN BEHIND THE CURTAIN While the name Judy deSouzaRybar isn’t as recognizable as those that have graced the stage of the Sydney Opera House, to Cushman & Wakefield she is just as important. Serving as Cushman & Wakefield’s Sydney Opera House account manager, overseeing this extraordinary building is all in a day’s work for deSouza- Rybar. For the past 12 years, Cushman & Wakefield and deSouza-Rybar have helped maintain the iconic exterior and interior as well as manage the many specialized requirements of one of the world's most recognized buildings. It’s quite a responsibility to care for one of the world’s most treasured icons, however it’s one that the Cushman & Wakefield team and deSouza-Rybar are proud to embrace. Building the story behind the building KBS Realty Advisors is one of the largest owners of Class A office space in the world and delivers exclusive work environments tailored to the unique needs of their tenants. Paul Klink, Executive Managing Director, Investor Services, Cushman & Wakefield, sat down with Rodney Richerson, Regional President, Western Region, KBS Realty Advisors, to talk about the companies’ strategic relationship and shared values. Together, KBS and Cushman & Wakefield define best practices that maximize value and drive thought leadership in the industry. Paul: How did KBS’ relationship with Cushman & Wakefield begin and how has it evolved? Rodney: We believe in fostering partnerships with service providers and individuals that share in our corporate values, management philosophy and business ethics. These mutually supportive partnerships create a powerful dynamic that challenges the status quo, drives efficiencies and delivers industry-leading services to building tenants that transform the way they do business. We are always looking for ways to enhance ourselves within an industry full of disruption and constantly challenging ourselves and our partners to figure out how to stay ahead without compromising the quality of the KBS brand. The KBS and Cushman & Wakefield relationship began more than 10 years ago and has developed into a trusted partnership. The teams have a deep understanding of our priorities, business objectives and what we require from a service provider. As our portfolio in the Americas continues to grow and evolve, it’s crucial we have collaborative partners like Cushman & Wakefield to help us maximize the value of our portfolio. Clockwise from left: Lobby of 201 Spear Street located on the waterfront within San Francisco’s South Financial District; the expansive lobby of 171 17th Street in Atlanta’s Midtown submarket; Paul Klink and Rodney Richerson at KBS’ office Opposite page: 222 Main’s lobby provides views of the Wasatch Mountain Range and downtown Salt Lake City. Paul: What can you tell us about KBS’ real estate strategy? Rodney: Driven by the desire to make every KBS property perform at the top of its peer set, and the belief that we’re in the business of serving our building tenants, KBS employs an active, handson asset management philosophy. We believe the frequency of contact is critical to our success. We travel to our properties often to understand the needs of the tenants, meet with real estate professionals and promote a collaborative work environment that allows us to raise the bar on customer service, and ultimately, deliver maximum bottom line results. We approach each asset by figuring out the property’s unique potential and appeal to the marketplace while building the story behind it. We believe in listening to our tenants’ needs and translating those needs into solutions. We are in the business of serving tenants and creating work environments that help our clients run successful businesses. Remaining sensitive to the current challenges companies face, and how KBS can help resolve those challenges with real estate solutions, puts us at the forefront of transforming workplaces into a destination. Paul: What are the next big trends in real estate and where are opportunities for growth? Rodney: In today’s market, most businesses view real estate as a strategic competitive advantage and are making real estate decisions based on where the workforce lives and formulating a plan to attract top talent. Companies are also placing an intense focus on major trends such as technology, amenities and space design to attract top talent. Providing tenants with a creative building that has a unique story to tell allows them to benefit from a non-commodity solution that both serves the tenant and adds value for the investor. We believe employers are being faced with more hiring challenges, and we want to assist them by developing safe, functional workplaces so we can do our part in retaining their top talent. visualize themselves there every day, and look forward to coming back. For a typical KBS tenant, human capital is a key part of their company value proposition. Therefore, listening to our customers is one of the most important things we can do to ensure we successfully adapt and support the evolving workplace. Our ability to leverage these trends, find new ways to support our tenants and anticipate their needs is key to being a thought leader in our industry. Paul: How does Cushman & Wakefield support your strategic initiatives across the KBS portfolio? Rodney: The Cushman & Wakefield teams are excellent at providing real estate solutions that align with our strategic goals and objectives and deliver exceptional tenant satisfaction. Their extensive knowledge paired with deep industry connections provides our clients with leading insight into each asset’s market position – enhancing the client experience. Investing in a partnership with Cushman & Wakefield has proven successful, driving our results as an organization and maximizing the value of our portfolio. The pulse on healthcare consumerism Even if you don’t track healthcare statistics, you’ve likely felt it. Beginning as a trickle, healthcare consumerism is now becoming a torrent that is reshaping the healthcare industry. WHAT IS HEALTHCARE CONSUMERISM? Healthcare consumerism is a movement advocating patients’ involvement in their health care decisions – a transformation from the “doctor-says-patient-does” model to a two-way partnership. The movement encourages health information empowerment and knowledge transfer so patients can be informed and engaged in the decision-making process about the kind of doctor they visit, the treatment they receive and how much they pay. Healthcare consumerism is being shaped by several industry-specific features that impede and redirect its force. For starters, the presence of public or private payers between patients and medical providers distorts the price/value decision-making process typical in most consumer markets. Buying healthcare is not the same as buying groceries or a car, nor is it similar to seeking service expertise, such as financial planning advice. Presently, access to information regarding the quality of care or its costs is often not readily available to patients, which complicates their ability to make informed choices about their treatment, regardless of their preferences. Also, measuring consumers’ preferences and how they might affect healthcare buying patterns remains elusive. A 2016 study by McKinsey & Co. noted significant disconnections between what healthcare consumers say is most important to them in regards to healthcare choices and what correlates with their actual satisfaction levels. A one-size-fits-all consumer strategy is unlikely to meet the diverse needs of most existing healthcare providers’ patients. Instead, successful strategies for organizations require careful analysis of both their existing patient base and their preferences for receiving and paying for care, as well as the healthcare providers’ goals – clinical, operational and financial. Consumer preferences vary significantly depending on the age of the patient. The Advisory Board Company, a highly regarded healthcare consultancy and advisory firm, surveyed thousands of consumers across the U.S. and found the following key distinctions in consumer preferences by age and type of care required. The type and cost of care typically provided in urgent care centers, specifically a desire for free visits, topped the list for consumers in both the 18 to 29 and 30 to 49 age demographics. Patients in the 50 to 64 age group prioritized access and convenience over price for this type of service, and those over 65 generally seek provider continuity and quality over other features such as price or convenience. Patients in the 18 to 29 demographic are more likely to shop online to find a specialist of their choosing, while those in older age demographics were much more likely to adhere to referrals provided by their primary care provider or other trusted physician. Known in healthcare parlance as “virtual visits,” high numbers of each age group indicated that they’d consider a virtual visit if inpatient care was unavailable the day they seek an appointment. The 30 to 49 age group was most receptive to telehealth. A one-size-fits-all consumer strategy is unlikely to meet the diverse needs of most existing healthcare providers’ patients. they are vested financially, consumers are seeking new channels for getting many kinds of care. This is especially true of millennials, who are more open to new technologies and far less enamored with traditional models. While employer- and government-sponsored insurance plans typically cover the greatest share of coverage, U.S. consumers and their families are emerging as the fastest growing payer segment in the industry, according to NRC Health, one of the nation’s largest healthcare performance organizations. Traditional industry players (physicians, hospitals, insurers, drug and medical device purveyors, etc.) and new entrants are taking notice. The ability to access healthcare assessments, advice and even face-to-face appointments, similarly to how we access a range of social networks, are likely to become the norm and not the exception. Industry incumbents and new disruptors are now vying to get and keep control of the consumer. These organizations believe enterprise-level strategies to own access, patient experience and pricing can unlock tremendous value for their constituents. For example, numerous hospital systems are partnering with or acquiring urgent care networks; traditional and new-entrant retailers are eyeing healthcare ventures; private equity firms are backing specialty physician groups; and major pharmacies are buying health insurance companies. stay engaged with one another. While adoption in the U.S. has been slow, many European firms have developed useful approaches. For instance, in November 2017, the UK’s National Health Service awarded the first trial contract for a specific telehealth system based on hand-held technology in the UK Public Health system. The system, which is now operational, is known as "GP at hand." This is a 24/7 wearable technology that has massive operational and cost implications for patients, doctors, administrators and all those associated with the provision of healthcare. Experts expect that these types of tools will challenge the infrastructure surrounding healthcare delivery. While this initial trial centers on London, it is expected to migrate to major cities around the UK. The technology, powered by Babylon Health, relies on proprietary artificial intelligence developed in the private sector over the last few years. Babylon’s mission is to put an accessible and affordable health service in the hands of every person on Earth - bringing the burgeoning power of AI and best-in-class medical expertise together. For most teenagers, millennials or those living in remote areas, hand-held technology is often the best and/or preferred means of communication. The ability to access healthcare assessments, advice and even face-toface appointments, similarly to how we access a range of social networks, are likely to become the norm and not the exception. Looking beyond consumers to healthcare providers, insurers and facilitators, handheld medical technology solutions have massive attraction, not least on economic and operational grounds. Indeed, technology platforms and companies with a global reach may well lead the charge toward a whole new approach to the delivery of medicine – from medications to expert advice and monitoring. THE FUTURE OF HEALTHCARE REAL ESTATE Precisely how healthcare consumerism will affect the real estate footprints of incumbent healthcare providers and new market entrants remains to be seen. For the last 10 to 15 years in the U.S., we have seen ambulatory facilities, such as medical office surgery centers and free-standing emergency departments, flourish and grow in number, particularly in locations away from hospital campuses. We’ve also seen the proliferation of healthcare service offerings in retail settings. There are now more than 15,000 retail/urgent care and 23,000 diagnostic/treatment locations across the U.S., many of which are situated on outparcel or inline retail centers, very close to where consumers buy other products or services. Even in traditional acute-care locations, there’s been significant focus on enhancing patient/consumer experience through building design and access. Meanwhile, telehealth initiatives bring the promise of locating care closest to the patient – quite literally to their fingertips on a mobile or wearable device – with no lease or asset purchase required. While we may not be able to see all the impacts this new wave of healthcare consumerism will bring to the real estate industry, we can be confident that the industry and its approach to supporting healthcare providers will adapt alongside these innovations in care delivery. s a society, we crave experiences. Our demands have shifted along the continuum from buying products, to receiving a service, and now to gaining an experience that is exciting and memorable. For example, experiencing a new travel destination is now more desirable than a shiny new fashion accessory. Therefore, customer loyalty must be earned through consistent, positive experiences that keep customers coming back for more. As the impact of the experience economy deepens, commercial real estate’s role in creating environments that support unique experiences has become increasingly important. To get a better understanding, let’s start where it all began – with Walt Disney. EMBRACING THE FOURTH ECONOMIC SHIFT According to Harvard Business Review, the experience economy represents the fourth economic shift, following commodities, goods and services. Walt Disney was a pioneer of this shift, transforming his company from a media service organization to a full-blown entertainment experience business, notably with the creation of Disneyland. The service economy currently dominates the developed world, making up almost 80 percent of all employment in the U.S. As the service economy has expanded and is becoming increasingly commoditized, our perception of economic value has progressed – we increasingly expect a more premium and differentiated economic offering. Our love affair with experiences is growing in every aspect of our lives. We seek out positive experiences daily through our favorite coffee shop, cocktail bar or specialized workout class. This desire for uplifting experiences pervades our working lives, and real estate becomes the stage for new experiential offerings. DEFINING WORKPLACE CULTURE To meet ever-rising employee expectations, companies must rethink the drivers of workplace experience – from the physical environment and amenities to digital services and virtual workspace. Technology companies are renowned for their focus on delivering great experiences at work. A healthy mix of onsite baristas who remember your name, themed building designs, workplace concierges and massage chairs are designed to give staff a personal experience every day. Significant efforts have been made to remove the friction in workplace environments and to increase availability and choices of food, drinks, workspace format or downtime space that employees truly value. Additionally, building and strengthening a community within offices has become a priority for workplaces as internal and external event programs aim to drive organizational loyalty and reinforce business culture. Companies facing a war for talent and increasing competition across all sectors are seeking to understand how the built environment can provide a competitive advantage. A positive workplace experience and culture is a strong hiring tool, and ensuring employees are happy at work has been proven to boost productivity. Cutting-edge research on workplace experience takes the same level of analysis that companies have traditionally applied to their customers’ experiences, but turns the focus onto staff. Leading companies are using the principles and practices of user experience design, traditionally used in the development of technology and software products, to enhance workplace satisfaction through improved usability, accessibility and pleasure. with smart buildings’ learning algorithms – enhancing the office experience by delivering tailormade services and nudges to its users. GETTING TO THE HEART OF IT We can all imagine a scenario where we chose a product or service simply because of the person at the point-of-sale. In essence, experiences are all about people. In the real estate world, this means hiring and training the very best talent to take care of not only buildings and assets, but also the people who occupy them. Taking a cue from best-in-class hoteliers, facilities and property management professionals now supplement technical skills development with soft skills training to deliver service that is more anticipatory and personalized. For employers, this is a direct reflection of their brand and culture that can generate powerful results. After all, why do we pay three times more to buy coffee from the friendly barista? Is the coffee really three times better? Or is it the warm welcome and smiling face? Often, the how is more important than the what. As the experience economy continues to mature, both real estate owners and occupiers must think differently about competitive differentiation. Storytelling and emotive experiences, along with convenience and themed ambiance, will become key differentiators of properties and the spaces occupied by organizations. Those who wish to realize success will be quick to embed experience delivery at the heart of their economic offering and evolve this over time. But how do providers begin to think differently? DEFINE A THEME AND BUILD A STORY. This can be at the building level or across all the services provided. Making it memorable means telling a story. REFRAME THE ECONOMIC DECISION. When goods still reigned the throne, many companies started providing free services as a differentiator. Eventually, those companies began monetizing said services. Begin by asking the question: If we charged a fee for experiences, what would we offer? It enables the provider to truly think outside the box and deliver something exceptional. BE STRATEGIC IN THOUGHT. Define the end-point, map out the customer journey and identify user needs. Ensure your experience offering aligns with organizational culture. MAP OUT THE METRICS. Whether it's improving employee engagement or increasing the number of customers, define what you aim to achieve. An experience is ephemeral if you donâ&#x20AC;&#x2122;t define its expected impact. Now real estate providers must follow in Walt Disneyâ&#x20AC;&#x2122;s footsteps: end-users must become guests and the workplace must become the sum of its experiences, not the sum of desks and meeting rooms. Leading with innovation: Google on their real estate success In 1998, Larry Page and Sergey Brin, two students from Stanford University, launched Google Search, one of the first web-based search engines. Today, “Google” is a verb in the dictionary, and the company’s innovative products – Gmail, YouTube, Android, Chrome and Maps – are household names and are integral to our lives. As the company has grown over the last 20 years, its portfolio has grown steadily with it. In California's San Francisco Bay Area alone, Google now encompasses almost 200 buildings. espite housing a large part of Google’s real estate, the Bay Area represented the only region within Google’s portfolio that didn’t outsource the management of its facilities. With more than 115 different vendor contracts to manage, Google was looking for ways to leverage a single outsource partner to increase speed of execution and drive innovation across all service lines. After an extensive RFP process, Google chose Cushman & Wakefield as their real estate provider due to the firm’s strong account team, executive engagement model and deep focus on employee engagement. In January 2018, Cushman & Wakefield kicked off its first-generation Integrated Facilities Management (IFM) outsourcing contract with Google, which has since developed into a strategic partnership. The Edge sat down with Darrell Smith, Director of Facilities, Google, and Brandon Tanner, Account Leader, Cushman & Wakefield, to talk about how the partnership has positioned Google for growth and innovation. When it came to the transitioning from multiple vendors to Cushman & Wakefield’s IFM offering, what were your expectations? Darrell: At Google, the employee experience is everything. So, we wanted to make sure there was minimal disruption to our employees during the transition – it needed to be seamless. To that end, we created scorecards and incentives for both our team and Cushman & Wakefield’s team that were clearly aligned with our expectations. In addition, both teams maintained open and transparent communication – with Cushman & Wakefield’s platform team especially critical to the transition’s success. From day one, we took a partnership approach, asking “How can we work together to create a better workplace for Google?" This mentality has made a huge difference in the success of this transition and set the tone of our partnership. In my more than 20 years in the facilities management business, I’ve managed multiple large-scale IFM outsourcing projects with the transition typically being the hardest part. This was by far the most seamless and successful transition I’ve experienced to date. What elements of Google’s culture did you focus on as you built your team? Brandon: I was interested in finding the best and brightest talent. Because speed in execution is a core component of Google’s culture, I also wanted to ensure I had a team that was able to work quickly, think creatively and be flexible to changing needs. What is the greatest challenge you face as your teams work together to ensure you’re fostering spaces that enable Google to thrive? Darrell: Considering how quickly our campus is growing, ambiguity and change seem to be constant challenges for us. Having clearly spelled out roles and responsibilities to help us manage Google’s ever-changing business needs, as well as remaining focused on the employee experience, have been key to our success thus far. Brandon: Google is a very collaborative environment and all the organizations work together in some way or another. As a team, we must be able to embrace the change and high volume of moves as Product Areas shift and realign. Our Cushman & Wakefield team is constantly challenged to provide workspaces that foster collaboration at a pace and rate we rarely see in our market. Operational efficiency is a priority for Google. Tell us more about this. Darrell: Prior to partnering with Cushman & Wakefield, we had 115 siloed vendor partner contracts. That’s because we had never been through an outsourcing effort – we just continued to add vendors, which was ultimately very inefficient. To become much more efficient, we knew we needed to evolve and move to a pure outsourcing model that could improve quality and user experience while providing more value than we’ve ever had before. With Cushman & Wakefield focused on the service delivery and operational side, my team can now focus more on the strategy side. With this partnership in place, we are optimized for success. Tell us about your work with Smart Buildings and how that has become a core element of your operational strategy. Darrell: Across our portfolio, we have 20,000 assets that produce data every minute – from mechanical to electrical to water meters – and we’ve historically done very little with this data. Through our Smart Buildings program, we are working with Cushman & Wakefield to aggregate all this data to make it actionable, enabling informed decisions. For example, now we can analyze our lighting data to better understand occupancy or review our conference room data to assess utilization. With our Smart Buildings approach, we can now go from reactive to proactive to predictive in order to drive operational efficiencies - and this is only the beginning. Going forward, we will continue to leverage the Google Cloud and apply Machine Learning and AI whenever and wherever possible, which is extremely innovative and exciting. What type of innovations and advancements are you implementing to make your buildings smart? Darrell: Like a lot of portfolios across the world, we already have all the data we need to make our buildings “smart.” The real challenge is pushing this data to a platform and automating the analytics and processes. Buildings have been operated the same way for the last 30 years – our plan is to be disruptive. We want to change the approach to portfolio operations through a robust platform and data analytics. The end goal is to create the healthiest and most productive spaces in the industry, allowing “Googlers” to thrive. Google is known for attracting and retaining the best talent. How is Cushman & Wakefield building the right team for the job, and how do you continue to develop them? Brandon: I’m very passionate about developing and retaining talent. To start, we have a very deliberate recruiting strategy that focuses on bringing in talent at all levels and helping them grow quickly. We also rely on the recruiting skills and referrals of our employees. Referrals are vetted within 24 to 48 hours, and feedback is quickly provided to those that have provided the referral. Our goal is to have a pipeline that allows us to immediately fill open roles. We’ve also created and piloted a leadership development program, as well as an internship program. The leadership training program TAL (Team Accelerate Leader) has a mission to solidify and grow talented silo-breakers, communicators, exceeders and mentors into the future leaders of Cushman & Wakefield. For the internship program, we hired three future leaders who are currently college students within the areas of Space Management, Facility Management and Project Management this past summer. We have plans to expand that number to 10 in 2019 as well as assist our peers in Silicon Valley on recruiting their interns. Tell us about some of the best practices you developed ? Darrell: Throughout this process, we’ve developed several best practices, but the following have enabled our joint team to achieve measurable success. The Facility Operation Response Team (FORT) is the 24/7 Operation Center that has been a huge game changer for our team. Prior to partnering with Cushman & Wakefield, our operations center consisted of one technician in the field who worked tirelessly after hours and on the weekends. The span of our portfolio is about 45 miles, so this was clearly not the model for success. With the FORT, we have a centralized operations center that is staffed 24/7. This allows the Cushman & Wakefield team to operate all the buildings from one location. Cushman & Wakefield’s Business Intelligence (BI) team has built robust dashboards, allowing my team to manage the business through data using Google’s tools. For example, the Customer Satisfaction dashboard allows our team to see the top-level metrics by week, month and quarter, as well as drill down to the individual ticket level. And the CAPEX dashboard contains the assets across the portfolio (approximately $3.5 billion), allowing us to use this data to prioritize lifecycle investments based on principles. Our work around Digital Buildings and the FORT will change the way we operate and design our buildings going forward. Brandon: For me, one of our best practices is the way in which the leadership team works together and collaborates to make decisions. We are innovative, energetic and want to make a difference at Google and in our industry. What does the future hold? Darrell: As technology plays a key role in our ongoing success, it’s going to continue to be the anchor of our go-forward plan. After all, Google is a technology company, so we’re expected to be technologically innovative at every turn. Fortunately, we are seeing the same commitment to innovation in technology from Cushman & Wakefield as they continue to make investments in technology that are mutually beneficial to both of our organizations. Between the dashboards, smart building programs and process work, innovation is happening all the time at every level. And it’s only going to get better. Brandon: Google is the industry leader in data analytics. We purposely built a strong analytics team to deliver data-driven operations in all our business decisions. We will continue to push and accelerate our use of data and dashboards to drive informed decisions. We have a good head start and we look forward to further advancing our dashboarding and analytical tools. The end goal is to create the healthiest and most productive spaces in the industry. * All dollar amounts listed are in USD. ost people think sales and deliveries are the only key drivers of peak success, but reverse logistics can make or break a retailer’s profit goals. The surge in eCommerce, and the resulting surge in returns handling, is driving demand for dedicated processing warehouse space around the world. Online sales in the U.S. continue to grow at a steady 15 to 16 percent rate annually, and will top $500 billion in 2018. Based on historical trends, National Retail Federation (NRF) projections call for approximately 30 percent of online purchases to be returned, compared to approximately 10 percent of in-store purchases. NRF also projects approximately $350 billion in total merchandise returns between online and in-store in 2018. At three times the return rate of instore purchases, it is clear that the huge disruption on the sell-side of our increasingly omni-channel world is matched by disruption in what happens post-sale. By offering a free, seamless returns experience, retailers all but incentivize us to buy all the sizes and styles we might possibly need, knowing we can keep the ones we want and return the balance. With no consequence of over-ordering, there is little reason to moderate our bulk-buying habits. Just as there is no such thing as free lunch, there is no such thing as free returns. To retailers, returns – or “reverse logistics” – is another cost of attracting and engaging customers. * All dollar amounts listed are in USD. dispatching the goods to store shelves or a fulfillment/distribution center for future sale; selling in bulk to a discounter or jobber; or trashing damaged goods if necessary. In fact, some retailers provide a full refund and tell customers to keep items that are too cumbersome and costly to return, like furniture. customers compared to what is spent attracting new customers. Return policies and processing are vital parts of the investment needed for customer retention because of the value-add for customers. using a 3PL might be a preferred solution for many retailers. In contrast, omni-channel retailer giants handle much of their online reverse logistics themselves, most commonly in dedicated warehouse processing facilities if not in physical stores. At scale, some retailers will self-perform reverse logistics for some inventory types while outsourcing other return types requiring specialized skills or equipment. A good example of this is handling returns of electronics, where returned devices must be assessed for damages and shelf life, then potentially placed in open box inventory to be resold. Many retailers of varying sizes and types elect to self-perform processing in a dedicated portion of a fulfillment or distribution center. Designating certain dock doors and separate process flows within a larger center can be a compromise solution. A recent Internet Retailer / Bizrate survey found 46 percent of shoppers prefer to handle returns at a store while 27 percent prefer return shipping. Retailers that have been among the most successful in leveraging their store network for online purchases realize the advantages of customers driving their returns to physical stores. Inventory eligible for resale at full value can be re-stocked immediately without further transportation, and historical trends confirm high incidence of additional impulse purchases when consumers opt for an in-store return. Reverse logistics facility requirements are determined by the type of goods being processed. For smaller inventory items, 40â&#x20AC;&#x2122; clear heights and wide bay spacing may not be necessary. A significant dock door count ensures flexible material handling flows inbound and outbound along with generally standard trailer parking. On the other hand, some 3PLs may start tenancy with more manual returns processing and later choose to repurpose the leasehold for more automated fulfillment processing. Against this possibility, some reverse logistics users may seek more of a modern fulfillment type shell with 40â&#x20AC;&#x2122; clear, significant power and extensive associate and trailer parking. Most supply chains are built around the need to push goods in one direction. Never has there been such a mandate for equally robust and efficient reverse logistics processes and warehouse space in which to execute them. Just imagine the journey that too-small pair of sneakers takes after you print that return label and drop it in the mail. You can be sure that every time those shoes are touched through the process on the way to the next customer, the retailerâ&#x20AC;&#x2122;s margin gets slightly smaller. For more information on eCommerce and the changing retail landscape, please visit www.cushwakenewcommerce.com. Impact in EMEA1 The situation is similar in the UK and continental Europe. BarclayCard, a leading global payments business with extensive data on online and in-store purchase and return behavior, reports: “It’s clear having an effective and convenient returns policy that satisfies customer needs is a crucial factor of success for retailers.” Aside from the competitive pressure to offer free and simple returns, BarclayCard finds inconsistency in clothing sizes among leading retailers as a contributing factor to over-ordering by customers. One retailer’s size 12 is not necessarily another’s. In the UK, for example, survey data finds that 26 percent of retailers have experienced an increase in returns in-store and online over the last two years, with the number of returned items up an average of 22 percent. The so-called ‘Phantom Economy’ of reverse logistics is a global challenge. n a global scale, eSports is becoming more popular than baseball, basketball and football. In fact, more men age 18 to 25 watch eSports than traditional sports, according to eSports Marketing Blog. With the global population having easier access to technology, the ability to embrace this new means of competition is accessible to all. Thus, eSports has made its mark on the most coveted generation of viewers and participants the world has ever seen. a compound annual growth rate (CAGR) of 4.5 percent. Over that same time period, PwC predicts global eSports revenue will grow by 20.6 percent per year (CAGR) 1. Video games are not just about playing anymore. There is an exploding audience of video game enthusiasts that enjoy watching other people play video games. Twitch, which was purchased by Amazon in 2014 for approximately $1 billion, boasts more than 15 million daily active users and more than 140 million unique monthly visitors2. And, according to the NewZoo3 2018 Global ESports Market Report, there are currently 165 million eSports enthusiasts around the globe and another 215 million occasional viewers. To put that in perspective, the record for a Super Bowl-viewing audience is 114 million people4. Ownership and organization: the economics of eSports In addition to a strong and growing volume of participants and spectators, eSports as a business is gaining credibility. Several eSports teams and/or leagues are owned or co-owned by owners in the big four North American sports leagues (NFL, NBA, MLB and NHL). For example, Robert Kraft (New England Patriots), Jeff Wilpon (New York Mets) and Stan Kroenke (Los Angeles Rams and Colorado Avalanche) are all investors in the Overwatch League, which includes 12 teams and competed in its inaugural season with the Grand Finals Championship at a sold-out5 Barclay’s Center in Brooklyn, N.Y. Former athletes are joining the eSports ownership ranks as well. Shaquille O’Neal, Alex Rodriguez and Jimmy Rollins were all involved in a financing round for NRG eSports earlier in 2018. Magic Johnson – who is also an owner of the Los Angeles Dodgers (MLB), Los Angeles Football Club (MLS) and Los Angeles Sparks (WNBA) – is part of an investment group that acquired controlling ownership of Team Liquid, which has more than 50 players competing professionally across a dozen different games. Other notable owners include Ashton Kutcher, Mark Cuban, Rick Fox and current professional athletes Jeremy Lin (NBA) and Roger Saffold (NFL). In addition to professional leagues and teams, there is a burgeoning universe of collegiate eSports teams. In the fall of 2017, Lanxiang Technical School was the first Chinese school to enroll students in eSports classes7. In the U.S., there is now a governing body – the National Association of Collegiate eSports (NACE) – that boasts membership of more than 80 schools and 1,500 student athletes. A form of competition using video games. Most commonly, eSports take the form of organized, multiplayer video game competitions, particularly among professional players. The real estate of eSports Watching video games is not just a home experience for fans. Increasingly large-scale events are setting live attendance records. The Intel® Extreme Masters 2018 World Championship events 8 in Katowice, Poland, recorded 169,000 in-person attendees, which represents a small drop from the 173,000 spectators at the 2017 events. The same league puts on large annual events in Sydney, Shanghai and Chicago. The Chicago event is held at the WinTrust Arena, which is where the WNBA’s Chicago Sky and DePaul University’s men’s and women’s basketball teams play their home games. Most competitions are currently taking place in stadiums that are multipurpose venues for sporting events and concerts, such as the aforementioned Overwatch League championship at The Barclays Center. However, dedicated eSports arenas are popping up around the world. The city of Arlington, Texas, home to both the Dallas Cowboys and Texas Rangers, has begun construction on the $10 million eSports Stadium Arlington, in a redesign of its convention center. The 100,000-sf arena has seating for 2,000 spectators, which makes it the largest U.S. eSports arena, surpassing Blizzard Arena LA in Burbank, Calif., which seats 450 fans. tourist and shopping area that also boasts luxury residences, high-quality office buildings and fashion flagship stores. On the southwestern side of China, the Zhongxian eSports stadium in Chongqing is opening this year as part of a mixed-used development. Alongside the 7,000-seat eSports arena will be a luxury hotel, exhibition space, food and shopping options. Opportunities also exist for eSports to serve as a secondary use of existing real estate. Gfinity ESports Australia and the Hoyts cinema chain have partnered to install eSports arenas in movie theaters around Australia. experience games in very interactive ways, integrating eSports with virtual reality. Hotels can also benefit from eSports locations as an amenity and demand driver, as has been the case around the Blizzard Arena LA and the eSports Arena Las Vegas, the latter of which is situated inside the Luxor Hotel & Casino. All things considered, one could imagine the local eSports arena in all its different variations filling a physical and cultural space similar to arcades of the 1970s and 1980s. The ESL One Katowice 2018 and Intel Extreme Masters Katowice 2018 events took place over two weekends at the end of February and beginning of March 2018. League of Legends; Starcraft: Brood War; Heroes of the Storm; Halo; Dota 2; etc. All prize money amounts as provided on XY Gaming’s website. Epic Games announced in May 2018 that it would provide $100,000,000 in the 2018-2019 season to fund Fortnite competition prize pools. Urban farming takes root in CRE A new trend is taking root in commercial real estate that has the potential to positively impact millions across the globe: urban farming. Most people associate urban farming with rooftop gardens. While these are proliferating in larger numbers, they are only a small part of the trend. Developers and landlords are increasingly seeking to be eco-friendly and provide greater amenities to their residents â&#x20AC;&#x201C; whether they be apartment dwellers, office workers or restaurants seeking their own easily accessible farm-to-fork food chain. Using hydroponic (the method of growing plants without soil using water solvent), aeroponic (the process of growing plants in an air or mist environment, originally designed by NASA) and aquaponic (ecosystems that support both plants and fish) technology and LED lighting systems, urban farming operations create controlled environments that can potentially boost food production massively while simultaneously reducing the negative ecological Farming within impacts of agriculture. controlled Urban farms hold environments the power to means that food insulate farming producers no longer operations from the impacts of need arable soil, climate change, perfect weather or shifting weather even sunlight. patterns and/or drought. If these methods are implemented, the potential impact on food production output is massive. One leading Japanese farming outfit reports that their Tokyo operation boasts a crop yield that is 50 to 100 times greater per square meter than that of a conventional farm thanks to year-round crop production under perfect conditions. This means that some crops that may only be harvested two to three times a year on a traditional farm could be harvested as much as ten times more often using an indoor vertical farming layout. Meanwhile, vertical stacking means that the potential food production output of any piece of land can be multiplied exponentially. Additionally, because indoor cropping operations utilize extensive data-driven precision in their operations, waste caused by human error is also significantly reduced. Urban farming and indoor cropping operations donâ&#x20AC;&#x2122;t just hold a massive societal benefit â&#x20AC;&#x201C; they offer an extremely eco-friendly solution to a number of critical ecological challenges. By some estimates, 75 percent of our fresh water contamination is caused by agriculture, while 70 percent of fresh water usage goes to agriculture. Their patented aeroponic system of farming uses no sun or soil, relying instead on smart light, hydroponics, data, substrate, pest management and scaling systems to reap harvests. Indoor cropping operations utilize drain water and recycle it using state-of-the-art evaporation systems. Root misting systems allow these operations to use 95 percent less water than a regular field farm. Indoor cropping can feed overpopulated cities while using less land and water. These systems also offer the benefit of greater oxygenation of the plants themselves, which results in fresher, better tasting produce. In the U.S., produce travels on average 1,500 miles from farm to plate. Because these are controlled environments, indoor cropping operations donâ&#x20AC;&#x2122;t need to use pesticides or herbicides, solving for another ecological challenge. Instead of soil, plants are grown in re-usable cloth made from recycled plastic, and instead of sunlight, operations rely on specialized LED lighting systems. This also helps to reduce energy footprints. In dense urban markets, the rise of indoor cropping creates an opportunity for urban planners to reuse obsolete industrial buildings while reaping the benefits of reduced local reliance on traditional distribution chain and the need to import goods from far away. This means less strain on infrastructure, with fewer big rigs clogging local highways. Perhaps their greatest ecological benefit is in the reduction of food miles. On average, in the U.S., produce travels 1,500 miles from farm to plate. This, of course, impacts freshness as many foods lose nutrients and taste along the way, but it also has profoundly negative impacts in terms of greenhouse gas emissions. Urban farming operations eliminate the need for extensive distribution chains with the ability to grow crops close to the end consumer. The indoor cropping movement is hardly monolithic. A range of technologies already exist and others are being created. Some operations see an opportunity in rooftop farms. Though this concept is in its infancy, the rise of rooftop farming capabilities could potentially create new revenue streams for the owners of urban properties. tobacco, wheat and corn. However, the impact on other vegetables, fruits and flowers is likely to be quite significant. From a real estate perspective, this trend has barely begun to move the needle in terms of vacancy levels or rents. We expect indoor cropping operations to be a major growth industry in the years ahead. Because the goods indoor cropping produces don’t have as long of a journey to the end user as traditional methods, transportation costs will be reduced and pricing for consumers will be impacted positively, especially as these operations build scale. Meanwhile, the positive ecological impact of urban farming will also make the method popular with ecoconscious consumers. We expect urban farming and indoor cropping operators to be increasingly active in the market. Their impact will first be felt with obsolete industrial inventory. That said, the trend is not limited to industrial properties alone. From the perspective of adaptive reuse options, urban farming could play a role in the repositioning of any property type, and it is likely that both old manufacturing buildings and defunct shopping centers will be the first product types within the adaptive reuse category to see the affects. Eventually, as the trend of urban farming continues to flourish and further expand, there will be a tangible impact on the existing food supply and distribution chain. This won’t happen until cities become self-sufficient in terms of farming, and this process will take years if not decades – but it holds the promise of radical disruption. ou walk into your workplace and your chair automatically adjusts to your height, the air conditioning turns on and your favorite cappuccino awaits you at the employee lounge. Does this personalization leave you feeling empowered and fulfilled…or ultimately threatened by the invasiveness of it all? In recent years, advances in technology such as sensors and the Internet of Things (IoT) have transformed the workplace and will continue to do so. In fact, Gartner predicts there will be 20.8 billion connected devices by 2020, and the National Science Foundation says IoT is on track to connect 50 billion “smart things” by 2020 and one trillion sensors soon after that. efficiencies, maximized space utilization and improved safety. But collecting so much personal data is leaving many employees feeling unsettled and uncomfortable – especially since the technology is so new. How exactly is all this personal data being used? What happens if the building’s technology gets hacked? Are your rights being compromised? While there may not be answers to all these questions, what we do know is that this technology isn’t going away anytime soon. Instead, it’s only getting more prevalent. Now more than ever, realtime analytics have become essential as data-fueled insights continue to highlight new efficiencies in how we work. This article explores the good and bad that comes with smart technology, and what companies can do to ease fears of the unknowns. THE GOOD There’s no doubt about it – IoT in the workplace significantly improves the health, productivity and comfort of its occupants. Smart building applications not only enhance the overall user experience, they can also optimize space utilization and improve safety within a facility. Enhancing the overall user experience Collecting data over time enables companies to fine-tune the employee experience by: >> Informing employers about the types of chairs people prefer, and the types of desks – heightadjustable or not – in which the employees are more productive. >> Knowing the preferred temperature and lighting intensity in work areas. >> Measuring the amount of time spent working heads-down versus collaborating with others. >> Getting instant feedback. >> Automatically generating service requests. >> Optimizing traffic flows around common areas (cafes, parking, etc.). >> Offering a seamless security experience where biometric scanners eliminate the need for physical passes. Having this information allows employers to meet employees’ needs on a more consistent basis, which improves overall productivity and satisfaction. Optimizing space utilization According to a recent Gensler study, 83 percent of executives rank space utilization as the most important metric for making the right workplace decisions. With actionable data, facility managers can make better-informed decisions on how to add, reduce or redesign space than when insights relied on subjective employee surveys and workplace observations. Monitoring safety measures Safety in the workplace is a top priority for every company – especially when it comes to job sites, but it’s hard to ensure 100 percent compliance. The advent of artificial intelligence (AI) is quickly changing this. Now, technology is capable of monitoring and reviewing job site imagery 24/7, observing field personnel and providing an overall safety score that relates to compliance issues such as not wearing work gloves or jobsite conditions like poor housekeeping. Having this smart technology available has led to dramatically improved safety, productivity and quality on job sites around the world. Improving building security Landlords are looking into implementing biometric data scans to create a seamless check-in experience, reduce the costs of manual check-ins and minimize their risk profiles. There are now devices that can recognize faces, fingerprints, voices, palm veins, DNA, hand geometry and even odors for identification and access control purposes. The databases of user preferences, space utilization measurements, site images and biometrics are growing every day. more efficient space. Reiterate that any information collected via sensors will be used to understand the big picture and analyze trends across the organization, rather than to hone in on individual productivity. 4. Celebrate your wins: Whenever possible, celebrate office improvements made possible by smart technology. This will establish the connection between data collection and the success of your organization. Timely communication of measurable results will increase the likelihood of employees supporting your initiatives. 5. Deploy responsibly: Every company is responsible for protecting its employees. Whatever monitoring techniques are employed should be, above all, ethical and legal. Before implementing any tracking devices, make sure you know the law in your state or country. The misuse of biometric data can open up companies to lawsuits and breaches of sensitive information. Check out the sidebar to read about the variety of privacy laws globally. IoT is here to stay, so you must involve your employees in the journey early. Frequent communication and change management are crucial for success. Getting people fully on board with why your organization is deploying smart technology is half the battle. Give frequent updates and address privacy and security concerns. Build trust, ask for feedback and act on it. UNITED STATES When it comes to privacy laws, the U.S.’s federal and state privacy laws vary widely. According to the National Conference of State Legislatures, 31 states have data disposal laws and 47 states have security breach notification laws, but the laws are not uniform. Last year, the Federal Trade Commission issued a report containing best practices for protecting user data, aimed at companies who make IoT-connected devices. The recommendations included designing devices with data security in mind, conducting tests of security measures on a regular basis, avoiding collecting more data than necessary, and displaying privacy information in a way that's easy to understand and appropriate for the device. CANADA In Canada, a federal law called the Personal Information Protection and Electronic Documents Act (PIPEDA) sets rules on how companies are required to protect personal data. The law requires companies to create a privacy management program; limit collection, use and retention of data; give users access to information the company collects; and provide a way for users to file complaints with the company. Like U.S. states, Canadian provinces can create their own privacy laws, and three of them – Alberta, British Columbia and Quebec – have done so. EU The use of personal data for purposes other than what’s communicated to employees is a breach of confidence. To combat this, General Data Protection Regulation (GDPR) was recently enacted. Every processing of personal data in respect to an activity or transaction within the EU is now subject to GDPR, and the fines imposed for serious non-compliance are high, leading stakeholders to bake in data security from the start. To achieve compliance, organizations need to map all their data processing activities and ensure they meet GDPR requirements by doing the following: •	Keep records to demonstrate compliance. •	Use data encryption for enhanced security. •	Aggregate or anonymize IoT data that can be directly or indirectly traced back to an individual. •	Limit data processing to the stated purpose. •	Be transparent and clearly communicate how data is used. •	Establish a lawful basis for each processing. MIDDLE EAST Few countries in the Middle East have laws regulating privacy of data and access to information. According to the 2015 International Compendium of Data Privacy Laws, Saudi Arabia has some laws regarding privacy and data collection, but no laws about data security or notification of data breaches. e all know struggle of a busy lifestyle - balancing work, kids, family, friends and other commitments often makes it difficult to maintain healthy eating habits. We feel the pressure from the societal notion that a healthy life is a happy life, but finding time to shop for and prepare healthy foods is difficult to incorporate into our busy schedules. Thankfully, the food industry is responding to the increased interest and need for convenient and healthy food options with new offerings like online grocery shopping, meal kits and an everexpanding selection of health foods. Delivering fresh food and groceries to the masses is no small task. It requires an intricate logistics model that accounts for product inventory, speed and freshness. Many food companies are reexamining how they market food and how to use the supply chain as a competitive differentiator â&#x20AC;&#x201C; itâ&#x20AC;&#x2122;s all about who can deliver food the fastest and for the lowest cost. Cold storage is the vital link in the supply chain that makes this possible, which is why evolving consumer eating habits are driving demand for cold storage space, particularly in proximity to densely populated areas. fresh, locally-sourced health foods is increasing in popularity. Healthconscious consumers are also driving SKU proliferation – the segmentation of products for improved customer choices – by demanding “healthier” versions of foods, such as gluten-or dairy-free products, organic produce and more. Perhaps the best example of how SKU proliferation and changes in consumer tastes are combining to drive increased demand for cold storage is the yogurt industry. Not long ago, there were only two dominant yogurt producers with several products each, but the widespread popularity of Greek yogurt has completely remade the market, both in terms of players and products – all of which require more cold storage and logistical support. Furthermore, as global consumer preferences continue to evolve away from frozen foods to fresh produce and other foods that require cold rather than frozen storage, there will be a rebalance of frozen and chilled space within the cold storage industry. Finally, the meal kit industry has grown to combine convenience and health into one nicely bundled package of ingredients delivered straight to your door. Meal kit companies have a clear target audience: the busy, healthconscious consumer. The market for meal kits grew 40.7 percent last year in the U.S., according to a report by Earnest Research. While identifying the target consumer may be easy, customer retention is tough and the supply chain and logistics behind preparing a meal kit and delivering fresh ingredients are quite complicated and expensive. circulating cold air vertically is more efficient and the cost of increasing the ceiling height is less expensive than building additional heated concrete floor and sub-floor base. Going vertical also provides more space on the site for delivery vehicles and is ideal for automated picking systems. With labor costs projected to increase, automation will be an important factor for companies to consider. The food industry also requires different material-handling equipment and labor. Grocery and meal kit delivery services, which require a human touch, differ greatly from the process of distributing pallets of product to retail locations. Food, particularly fresh food and produce, is delicate and easily damaged. Companies must be careful to avoid costly losses caused by damage and spoilage. There are indications, however, that material-handling technology is catching up to the challenge. Kroger recently acquired a 5 percent stake in the aforementioned British onlineonly supermarket Ocado, which has developed technology for automating food distribution centers. COLD STORAGE IS HOT AND GETTING HOTTER Revenues for the cold storage industry are projected to increase at an annualized rate of 3.6 percent to $6.3 billion from 2017 to 2022, according to IBIS World Industry Report on Refrigerated Storage in the U.S. With the long-term trends of increased demand for cold storage space and low interest rates, investors, including REITs, are looking to add cold buildings to their portfolios to increase diversification within the sector. The MetLife Cold Storage Industry Outlook reported the capacity of cold storage in the U.S. has increased 43 percent since 2000 due to construction of larger facilities. Profits in the cold storage industry have also increased 83 percent over the last five years, according to the same report, further motivating investors to capitalize on this type of product. Cold storage third party logistics providers (3PLs) are leading technological advancements in refrigeration and building construction. According to the USDAâ&#x20AC;&#x2122;s Capacity of Refrigerated Warehouses summary, 3PLs currently account for 79 percent of all refrigerated cold storage space in the U.S. Private equity investors have been eyeing the sector and have recently made large investments in cold chain 3PLs, further pushing growth in construction and acquisition of existing facilities and operators. The busy, health-conscious person can finally catch a break. Feeding the family is as easy as firing up a phone or computer to order groceries or a meal kit subscription. Food companies are winning by shifting to meet the changing demands of the people to maintain relevance and profitability. However, the biggest winner is probably the cold storage industry, as it will likely continue to gain momentum. Being cool has never been so hot. U.S.-China trade relations have continued to intensify. In September 2018, the U.S. announced that it would impose new tariffs on an additional $200 billion worth of Chinese imports, and that it was prepared to tax all Chinese imports. And, there are already $50 billion in Chinese imports subject to higher tariffs. China responded with its own levies on an additional $60 billion worth of U.S. products, on top of the $50 billion already implemented. As trade tensions continue to heat up, much is at stake. One of President Trump’s key campaign promises was to challenge trade agreements particularly those with which the U.S. runs a trade deficit. As of August 2018, the U.S. merchandise trade deficit with China stood at a record $38.6 billion. Relying on Section 301 of the Trade Act of 1974, the U.S. proposed tariffs on steel and aluminum imports from China, Canada and countries in the European Union (EU) in March 2018. The U.S. administration articulated that the tariffs were needed to safeguard national security and the intellectual property of U.S. businesses, and to lessen the U.S. trade deficit with China. While these tariffs were levied on China in March, some key U.S. trade partners were initially exempted from those tariffs, including the European Union, Canada and Mexico. However, by June 2018, those exemptions were revoked. In August 2018, the U.S. administration imposed a 25 percent tariff on a further 279 Chinese products worth $16 billion a year. China immediately followed this move by levying higher tariffs on goods and products from the U.S. worth the same amount – 25 percent on $16 billion a year. In the latest round of higher import duty implementation, additional tariffs on $200 billion of Chinese goods imported into the U.S. went into effect in September 2018. China has responded to this move by raising tariffs on $60 billion of goods imported from the U.S. In July 2018, the U.S. levied higher import duties on $34 billion worth of goods and products from China, to which China responded with similiarly sized excise duties on imported U.S. goods and products. With currently 7.6 percent of its exports going to China, the U.S. is less exposed to tariffs from China. In China’s case, 18.9 percent of its exports are sent to the U.S., making it important for Chinese companies to consider further developing other existing secondary markets or seeking new secondary markets for their exports if the trade dispute deepens and becomes prolonged. This could be of greater consequence in the future, given duties implemented or proposed by the U.S. now stand at more than 7,000 tariff line items covering $250 billion of imported goods and products from China. It is possible that some U.S. companies may need to seek or develop other secondary or new markets for their exports as a result of recent escalation in tariffs. However, if the U.S. is tackling a trade conflict on several fronts at that time, it might limit the opportunites for U.S. companies to further develop existing secondary markets. Current tensions have thrown another source of economic volatility into the mix. Generally, occupiers, developers, investors and owners of real estate are opposed to tariffs as it is expected to increase the cost of doing business. Further, the uncertainty created by the trade dispute makes it difficult to strategically plan. This is of particular concern for U.S. companies currently doing business in China. A total of 28.6 million sq m of future office supply through to 2022 will place pressure on rentals in several city markets going forward. For occupiers, this will be welcomed as more space options will become available at more favorable rental rates. With the supply coming online along with the trade disputes creating additional uncertainty, occupiers may have a window of opportunity to capitalize and sign deals for more favorable terms. When considering the amount of new supply through to 2022 as a percentage of current stock, the first-tier city market, which will see the largest relative increase in new supply, will be Shenzhen at 156.7 percent. For the second-tier city category, it will be Xiamen at 137.6 percent. On the other hand, first- and second-tier markets, which are expected to receive comparatively less supply over the next five years, are Beijing and Hangzhou at 19.1 percent and 30.1 percent, respectively. Office market dynamics give occupiers, developers, investors and owners much to consider without factoring the impact of trade tensions. Trade tensions: No obvious place to hide As for future demand for quality office space in Mainland China and market exposure to trade frictions between the U.S. and China, a lot depends on how entrenched the trade conflict becomes. If the trade war continues to escalate, it will directly affect U.S. and Chinese businesses that produce higher-tariffed goods as exports will be highly exposed. In turn, given this situation, wherever these companies hold office space in Mainland China, there will be a good chance they will not seek to expand their office presence in the country. Having said this, whether they are U.S. companies operating in Mainland China or Chinese domestic companies, exposed companies are not concentrated in one or a few office markets in Mainland China. They have an office presence across many city markets in first-and second-tier cities. Therefore, from a developer, investor or ownerâ&#x20AC;&#x2122;s perspective, certainly some cities and product types will be impacted more than others, but a worst case scenario of a full blown prolonged trade war will have implications for most if not all Chinese real estate markets, and indeed, will have implications for most U.S. and global markets as well. EU-U.S. TRADE RELATIONSHIP: IMPACT ON PROPERTY MARKETS In contrast to the deteriorating U.S.-China trade relationship, the EU-U.S. trade relationship has improved recently. The preliminary deal aims for free trade between the EU and the U.S. in non-auto industrial goods â&#x20AC;&#x201C; an ambitious goal at this stage â&#x20AC;&#x201C; but, perhaps more significantly, there is a commitment not to impose new tariffs while negotiations are underway. This de-escalates tensions over trade and eases fears about the direct impact of rising protectionism on the EU economy and property markets in the short term. Although rising protectionism globally has had a negative impact on business sentiment and casts doubt over future investment plans, the direct impact on property markets will likely be limited to industries exposed to trade with the U.S. and China. Regardless of trade conflicts, European property markets are looking increasingly late cycle. High rents, slowing employment growth and rising development activity in selective locations is likely to lead to slower rental growth over the coming years. When coupled with outward yield shift, driven by a tightening monetary environment, there may be negative capital growth and lower returns. This is highlighted by the Cushman & Wakefield European Fair Value Index, which can be accessed at cushwk.co/fairvalueindex. Will robots take over CRE? Driverless cars, blockchain, and other transformative technologies echnology is disrupting all kinds of industries, from ridesharing and taxis to streaming services in entertainment. Apart from some early adoption in the retail and industrial space – largely due to the disruptive nature of eCommerce – commercial real estate (CRE) has not seen a paradigm shift in implementing new technologies. Most change has been evolutionary, providing for more efficient ways to lease or manage properties. Broader adoption of technology within commercial real estate often lags behind other industries. Real estate and infrastructure assets are expensive and built more for longevity and a predefined lifecycle than flexibility. To embrace change, players in CRE markets must first be convinced that the technology will be widely deployed and long-lasting. But there is no doubt that long-lasting and widespread change is on the horizon with several technologies. Technologies potentially transformative to CRE Auto-related: Electric Vehicles (EV), ridesharing and Autonomous Vehicles (AV) Distributed ledgers: Blockchain and cryptocurrency Supply-chain technologies: Drones, 3D printers and autonomous mobile robotics Ridesharing, autonomous mobile robotics (AMRs) for eCommerce fulfillment and electric vehicles (EVs) will impact CRE first. Widespread adoption of most other transformative technologies is at least a decade away. Technology adoption typically follows a “hype cycle” curve before widespread adoption. Following wide adoption, there likely will be a lag in any impact on real estate. This lag should not be viewed as a “wait and see” period; rather, the early adoption cycle should be used to determine where impacts may occur and possible remediation strategies. The Organization for Economic Co-operation and Development (OECD) estimates 14 percent of jobs in member countries are 20 years from automation. High-risk jobs include routine and low-skilled ones in retail and industrial. Most office-using jobs are low risk due to their requirement for cognitive, emotional or social intelligence. Significant differentials by market and asset type exist Cities best suited to cope with technology disruption are the usual suspects: New York, San Francisco, Boston, Washington, DC, Austin, Los Angeles, and San Jose. Real estate assets likely to see growth include data centers, manufacturing centers for new technologies and remote parking and recharging stations. Successful real estate offerings are likely to be those that straddle uses. High-risk properties are gas stations, bank branches, non-experiential retail, garages (both residential and commercial parking decks) and non–amenitized or commodity offices. Commercial real estate will have to adapt The only way for CRE professionals to adapt to changing paradigms brought on by technology advances is to focus on flexibility and efficiencies, particularly flexibility in asset use and design, leases and service offerings and amenities. Read more on technology and its impact on CRE here: cushwk.co/CRERobots. WHAT IS PROPTECH? Short for Property Technology, PropTech refers to the myriad of startups and new technologies cropping up in response to decades of inefficiencies and antiquated processes in the real estate industry. PropTech is where technology and real estate come together to propel the industry forward, and it includes technology that impacts the entire real estate value chain – from dirt to disposition. Venture capitalist (VC) interest in real estate property technology (or PropTech) has grown significantly over the past five years. According to PitchBook data, the number of VC investments in real estate technology startups and early-stage companies more than doubled between 2013 and 2017. The value invested in PropTech deals nearly quadrupled over the same time period – from $523 million in 2013 to just shy of $2 billion in 2017. CB Insights estimates that approximately $5 billion has been invested in PropTech in the past two years1. The growing excitement in the sector creates opportunities, but it also has potential downsides. The fervor on the funding side can improve the chances of quality products being brought to market, but the sudden competition among VCs can lead to money chasing and weaker ideas that don’t merit the same time and support. 1 MIPIM News. “MIPIM Review: 2018 Will Be the Year of PropTech,” GlobalRealEstateExperts.com (Accessed September 25, 2018). * All dollar amounts listed are in USD. So much of the present and future world of work is driven by technology. PROPTECH AND THE UNIVERSITY So much of the present and future world of work is driven by the technology sector and startups that are additive and disruptive. Accordingly, university-affiliated incubators have been developed over the past decade to create ecosystems that link scholarship, business and innovation. Examples of technology incubators include DMZ at Ryerson University (Toronto, Canada); New Venture Institute at Flinders University (Adelaide, Australia); Tsinghua x-lab at Tsinghua University (Beijing, China); PoliHub at Polytechnic University of Milan (Milan, Italy); and StartX at Stanford University (Stanford, CA. ), to name a few. Similar-styled incubators with a specific focus on CRE technology are starting to pop up around the world as well. For example, a CRE innovation program has begun at Columbia University (New York City) involving researchers and students at Columbia partnering with companies with a stake in CRE developments from the wider PropTech ecosystem. Stanford University (Stanford, CA) also has a research consortium exploring CRE technology needs. 1871 is an example of another model that connects the university, early-stage startups and industry-specific incubators. 1871 brings together Chicago entrepreneurs from 400 high-growth digital startups with more than 100 education, community and corporate partners â&#x20AC;&#x201C; including Cushman & Wakefield â&#x20AC;&#x201C; to create a community that includes programming, events, inclusion efforts and other activities and initiatives that enrich the member experience and establish roots throughout the Chicago business and technology community. PROPTECH AND CRE FIRMS Cushman & Wakefield believes it is critical for leaders in the CRE industry to be involved with both incubators that are purely focused on PropTech as well more general technology accelerators. A diversity of partnerships has allowed Cushman & Wakefield to access tremendous opportunities to find innovation in other industries that will apply to our clients and their real estate needs. As CRE owners and investors are getting more involved with PropTech investments, different models of engagement have emerged and real estate firms have chosen different strategies. In some cases, firms have attempted to develop PropTech solutions in-house from scratch. In other cases, already-developed technologies have been purchased outright. Increasingly, real estate firms are looking to invest in PropTech funds to obtain access to early-stage PropTech companies. For example, Cushman & Wakefield has recently invested in PropTech funds created by MetaProp and other VC firms. While building solutions in-house or purchasing tech companies outright provides control of the technology, both strategies have downsides. Access to outside ideas and third-party financial investment can be limited. Additionally, the opportunity to engage with broader customer and user bases in a way that spurs innovation can be stunted. A broad strategy that includes both in-house development and investment in outside companies maximizes the opportunity to find and build upon great ideas no matter where they come from. By placing diverse bets with early-stage PropTech companies, later-stage technology investments and thought leaders in both CRE and technology, firms can position themselves to capitalize on PropTech developments and anticipate impactful trends as they start. Cushman & Wakefield's distinct approach is integrating PropTech investments and partnerships with our business and client needs, not adding independent bolt-ons. We believe in partnerships and an open innovation system that includes universities, VCs, our teams and our clients. We can accomplish more by working with multiple $100 million funds than by managing our own, since no CRE company is built to be an expert VC firm. WHAT'S NEXT Technology is rapidly impacting the real estate industry. It’s changing how investors, occupiers and service providers do their work, serve their customers and develop strategic business plans. Firms should focus on the following when developing strategies and implementing PropTech solutions: CONNECTIVITY Leveraging technologies that help sales teams better connect with their colleagues and clients in a dynamic fashion. This includes 3D visualization, interactive displays, sales enablement and artificial intelligence. INSIGHT Using technology tools that support strong decisionmaking through the use of data and analytics. PARTNERSHIPS Identifying opportunities to collaborate with other organizations that are focused on relevant technology solutions. This can include working with existing data companies, incubators, accelerators or visualization tools. Heroes at work: the next generation of talent bout 10,000 baby boomers are retiring every day. If we assume that boomers are represented in the facilities and property management field at about the same ratio as the general labor pool, then about one million people in vital facilities and property management roles will retire over the course of the next decade – and these jobs are not easy to fill. Most roles in the field require vocational training, especially as they become increasingly technologically complex. Veterans are an untapped resource for filling these kinds of facilities management and technical roles. They are hardworking, have received cutting-edge technical training and possess advanced team-building skills. By keeping a few key points in mind, you can help your company better attract and retain veteran talent. 1. Get involved in the military community. To attract veteran talent, you need to be connected to the military community. This can be achieved through participating in events like hiring fairs on military bases and offering transition assistance programs to people who have recently left the armed services. These efforts will help veterans and active service members become familiar with your company. 2. Just because a resume is filled with military jargon doesn’t mean it doesn’t apply to your business. Veterans are more qualified than you may initially think. Throughout their service, many of them will have received advanced training, led teams and managed budgets. They’ll also have cross-cultural experiences and a strong organizational commitment. Therefore, when reviewing veteran resumes, don’t be put off by a little bit of military jargon. Take the time to learn what that jargon means and how their unique experience can benefit your organization. 3. Supporting and retaining veteran talent is just as important as the hiring process. A U.S. Chamber of Commerce Foundation survey found that 44 percent of veterans left their first postmilitary job within one year with many feeling the job wasn’t a good fit or lacked a sense of purpose. To avoid this outcome, it’s important to foster a close-knit team atmosphere, as many veterans are looking for the same kind of camaraderie that they experienced while serving. Additionally, having resources that help veterans throughout your organization connect and share knowledge will encourage them to stay. Cushman & Wakefield has found success with our Military Transition Roadmap and Buddy Program, which pairs veteran new hires with a mentor who will provide them with advice and will help them discover networking opportunities, internal groups and other veteransfocused resources. Cushman & Wakefield is dedicated to hiring and supporting veterans. At our firm, they will find challenging and rewarding work directly related to their skills and talents. Just as importantly, they will find a camaraderie among the brothers and sisters, peers and leaders who support their distinct needs as well as a culture that honors and respects their contributions in the military and in our organization. A CULTURE THAT CELEBRATES VETERANS’ CONTRIBUTIONS AND LEADERSHIP An established culture of honoring and recognizing the contributions of employees at all levels of the organization. REWARDING WORK RELATED TO VETERAN SKILLS AND TALENTS Many rewarding opportunities including brokerage, asset services, global occupier services among countless others. A COMMUNITY OF CAMARADERIE Established employee resource group made up of individuals with common experiences. In it together Recently, the Cushman & Wakefield global team supported Avaya through financial restructuring and transformation.The Edge sat down with Cushman & Wakefield’s Todd Chitester, Global Alliance Director, and Avaya’s Hamish Clarke, Director of Global Real Estate, to discover how to deliver a world-class, full service global real estate strategy while balancing multiple stakeholder groups and changing workforce dynamics. the needs of all stakeholders: Avaya, the vendors and the Cushman & Wakefield account team. Working together, we were able to not only continue to deliver uninterrupted real estate services, but to deliver a portfolio strategy that was aligned to Avaya’s restructuring objectives. What solutions did Cushman & Wakefield implement to align to Avaya’s strategy? Todd: Our team leveraged the power of our resources and brand to develop solutions that aligned with Avaya’s strategy. We augmented the account team with management consulting to lay the framework for a long-term site strategy. Cushman & Wakefield’s Portfolio Services Center (PSC) provided us with variable resources to plug critical gaps that Avaya was looking to eliminate. Additionally, we called on our C&W Services and mobility partners to address immediate needs – the deployment of the space planning function was critical to enable rapid site consolidation and downsizing modeling. As a result of this work, Cushman & Wakefield received the “2018 Best Outsource Services Provider” at Avaya’s Supplier Days event held in Singapore. How has Avaya reshaped their real estate strategy? Hamish: Initially, we spent a lot of time on operational tactics, which included coordinating resources and migrating technology from various departments and systems, then consolidating into a single repository. This allowed us easy access to the business drivers of the decision process. Leveraging site data, headcount numbers, site location analysis and a plethora of other information was fundamental in underpinning confident decision making to significantly reduce Avaya’s portfolio. Additionally, our workplace redesign was a top priority for us. Revamping our new workplace and turning it into an experience became an essential element for attracting top talent and demonstrating Avaya’s culture, tools and capabilities to our clients. Our new space has sophisticated designs and amenities, flexible workspaces, enhanced digital tools, and of course, incorporates Avaya’s latest phone and video conferencing solutions. How has this recent transformation impacted Avaya and Cushman & Wakefield’s relationship? Todd: The Cushman & Wakefield account team adopted the mantra In it Together while improving each aspect of the account. From the beginning, we were committed to providing worldclass real estate services for our client. In partnership with Avaya, our dedicated account team transformed this challenge into an exciting new opportunity to deliver value for the Avaya portfolio. resident John Forrester began his Cushman & Wakefield career 30 years ago as a broker for DTZ in London. Since then, he has built a remarkable career as both a marketleading real estate expert and top executive. We sat down with John to talk about how Cushman & Wakefield has evolved over the years, how it’s differentiating itself within the industry, and how its clients and people are positioned for the future. ON HIS CUSHMAN & WAKEFIELD JOURNEY I started in London over 30 years ago leasing tiny office units in Mayfair. My work evolved and grew from there in London, to the UK, to Europe. Every time I felt like I had just about achieved some competence in a role, the company always managed to provide me with a new opportunity to keep me on my toes and challenged all the way to DTZ CEO. Then, three years ago, the whole industry blew up with the merger of Cushman & Wakefield and DTZ. This gave me yet another opportunity to work in an even bigger company that's continued growing to this day – and I'm growing right alongside it. 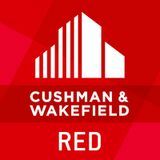 For me, Cushman & Wakefield is more than just an organization. I’ve spent well over half of my life working here, so it’s very personal to me. I know it’s a great business and our clients agree, which is demonstrated to us through all the incredible work we manage across the world every day. Today’s complex world is changing fast, and we are seeing this firsthand in the commercial real estate industry. From coworking to changing labor markets, corporate consolidation to the increased flow of global capital – companies know they need to keep a pulse on all these trends, and we’re there to help them figure it out. As a firm, our purpose is to put our clients and our people at the center of it all. We have the insights, scale and resources to help our clients get the most out of their real estate. Innovation and technology are disrupting every industry and commercial real estate is no exception. The world is more interconnected than ever before, and we have experts who are excitedly embracing advancements in technology to take clients to the next level. We’ve invested in our technology infrastructure, so our people can deliver the best results for our clients fast and with real accuracy. The most important question clients are asking is, “Where should I put my money?” And we’re there to provide context, share best practices and help clients make big strategic decisions. ON OUR TALENT I have never been more proud of, or more energized by, the quality of our people. Our employees are sophisticated, specialized and knowledgeable of advancements in the industry and marketplace as they continue to make well-informed, educated decisions for our clients. We value fresh thinking, diversity and, most importantly, people who challenge the status quo to do work in new ways. For me, what’s next is doing the next assignment through fresh eyes and new insight, not just repeating what worked last time out. I am also extremely proud of the quality of the leadership talent that we’ve put in place – they truly are the best of the best. In my opinion, no other firm in our industry has this unique level and mix of talent, experience and authenticity. Copyright ÂŠ 2018 Cushman & Wakefield. All rights reserved.